Farmworkers do rely on some of the provisions of the federal Fair Labor Standards Act (“FLSA”) and the Migrant and Seasonal Agricultural Worker Protection Act (“AWPA”) to provide minimum levels of worker protections. These laws and their impact on the lives of farmworkers are described in some detail below. The Fair Labor Standards Act (FLSA), originally enacted in 1938, guarantees most workers a minimum wage for each hour worked. FLSA also provides for overtime pay by requiring that most employees who work more than 40 hours in a workweek be paid one and one-half times the regular rate of pay for each hour over forty hours per week. FLSA further requires employers to comply with recordkeeping requirements, including maintaining payroll records for employees. The Migrant and Seasonal Agricultural Worker Protection Act (AWPA/MSPA) is the principal federal employment law for farmworkers. While the law does not grant farmworkers the right to join labor unions or access to collective bargaining, it does contain some important protections. Its roots are in a 1963 law that was enacted in the wake of Edward R. Murrow’s shattering documentary film about farmworkers Harvest of Shame, aired by CBS during Thanksgiving in 1960. AWPA includes the following requirements: agricultural employers must disclose terms of employment (wage rates and other job terms) at the time of recruitment and comply with those terms; employers must keep detailed records of wages and hours worked and provide workers with itemized pay statements; employers, when using farm labor contractors (“FLCs” or “crewleaders”) to recruit, supervise or transport farmworkers, must confirm that the FLCs are registered with and licensed by the U.S. Department of Labor; providers of housing to farmworkers must meet local and federal housing standards; and transporters of farmworkers must use vehicles that meet basic federal safety standards and are insured. Like FLSA, AWPA does not apply to smaller employers. In enacting AWPA, the legislature established labor law obligations on the part of the growers who employ farmworkers even if the growers use the services of farm labor contractors. Some growers have claimed that they do not “employ” any farmworkers and therefore need not comply with the minimum wage or other labor laws; such growers contend that the labor contractor is the sole “employer” of the farmworker. In some instances, growers contend that farmworkers are “independent contractors” and not “employees” at all. To address such problems, Congress also adopted a broad definition of employment relationships so that in most cases a farmworker is an “employee” and the grower who uses a FLC is responsible, as a joint employer with the FLC, for providing farmworkers with AWPA’s labor protections. The law is administered and enforced by DOL’s Wage and Hour Division, and through lawsuits in federal courts that may be filed by farmworkers. Labor contractors also are required to be licensed by the Department of Labor. With regard to working conditions, the Occupational Safety and Health Administration Field Sanitation Standard requires most employers to provide portable toilets and hand-washing water in the fields. Federal and State wage and hours laws protect workers’ rights to be paid for all of the hours they work. The Fair Labor Standards Act (FLSA), a federal law, requires that most employers pay a minimum hourly wage and pay time and a half for overtime over 8 hours a day and 40 hours a week. However, FLSA exempts farm labor from the time and a half overtime requirement. Additionally, if a farm does not have more than 500 “man days” of agricultural labor in a year (roughly equivalent to seven employees employed full-time in a calendar quarter) the farmer is exempt from paying federal minimum wage. But that is not the end of the story. Farmers must still comply with state minimum wage laws which vary by state. New York, Rhode Island and Connecticut require agricultural labor to be paid at the general state minimum wage which is $9.70 in most of NY, $10.10 in CT, $9.60 RI. And $8.44 in New Jersey. In Vermont, New Hampshire and Maine, agricultural work is exempt from the state minimum wage so is paid at the federal rate unless exempt as a small farm under FSLA. Currently the federal minimum wage is $7.25 an hour. Massachusetts has an agricultural minimum wage of $8 an hour. Meals and lodging may be credited against the minimum wage, but only with a written agreement between the employer and the employee, and the limits are different from state to state. For picking berries and tree fruit, some farmers pay “piece rate” which encourages workers to pick faster. They pay a certain amount per pound or other unit. State and federal laws require that the “piece rate” be set so that the slowest worker still makes minimum wage. Therefore, the farmer must have a good system for keeping track of each worker’s pickings, or else be at risk of being accused of wage theft. Knowing this clause, some farmers decide it’s easier to comply with an hourly wage approach. “The FLSA uses a two-pronged definition of agriculture that includes both primary agricultural activities as well as those activities that are secondary or incidental to carrying out the farming operation. The primary definition includes “farming in all of its branches” – cultivation and tillage, dairying, growing and harvesting horticultural crops, raising livestock, bees, fur-bearing animals, and poultry. Anyone performing these activities is engaged in agriculture regardless of whether he or she is employed by a farmer or on a farm. Selected Statistics on Farmworkers from Farmworker Justice: This memo is based on recent data from the U.S. Department of Labor’s National Agricultural Workers Survey (“NAWS”) conducted in fiscal years 2011-2012. The NAWS provides an economic and demographic portrait of crop workers and workers engaged in support activities for crop production at their workplaces. The survey encompasses workers on farms and in orchards, greenhouses and nurseries, which include the majority of nursery products, grains, and field crops, as well as all fruits and vegetables. However, it does not include workers in all types of agricultural production; it excludes livestock, poultry, and fishery employees. Although the survey covers a variety of farm jobs, including some supervisors, it excludes secretaries and mechanics. Income The average total individual income of farmworkers is $15,000-$17,499. 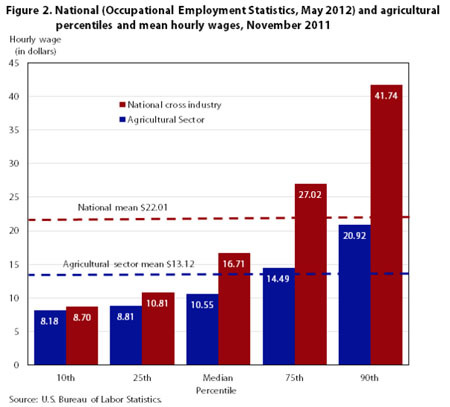 However, this figure includes income that some farmworkers earn from jobs outside agriculture. The average family’s total income from farmworkers is $17,500- $19,999. Family income has not increased from the level indicated in the FY 2008-09 data. The federal poverty level for a family of 3 is $19,790. Twenty-five percent of all farmworkers had a family income below the federal poverty line. However, because the survey results did not include dependents living outside of the United States, this number may not completely reflect the number of families living in poverty. Fifteen percent of workers stated that they or someone in their household had received food stamps in the previous 2 years; however, farmworker use of public assistance has historically been low and many families that are eligible may not be participating in the SNAP program. Unfortunately, DOL has not published a report in many years and until recently it even stopped releasing the data to the public. Farmworker Justice requested and obtained DOL’s release of the public data from the 2011-2012 surveys. The raw data is available at http://www.doleta.gov/agworker/naws.cfm. Whatever name you give it, federal law regards on-farm interns and apprentices as employees and to avoid fines, the employer must pay at least minimum wage for all hours worked. For a farm, taking on interns is not cheap labor. It is a commitment to providing a real learning experience and means that the farmer will be acting as teacher as well as employer. The California Guide to Labor for Small Farms offers several models for on-farm training that meet legal requirements. The trainees or students do not displace regular employees, but work under their close supervision. The employer that provides the training derives no immediate advantage from the activities of the trainees or students, and on occasion his/her operations may actually be impeded. The employer and the trainees or students understand that the trainees or student are not entitled to wages for the time spent in training. Some people take up farm work as a way to learn the skills for owning and running their own farm someday. Others do farm work for many years and may even choose to make that their life’s work. Our movement for a local, sustainable agriculture needs both more farmers and more professional farm workers. Knowing the responsibilities of an employer or the rights of a worker provides the basis for a positive relationship so that small farms function as integrated teams. In this era of climate change, it takes everyone’s contributions to make farms flexible and resilient. In her keynote speech at the NOFA-NY Winter Conference, Rosalinda Guillen, Director of Community to Community, spoke eloquently about “good hard work,” and about how her farmworker father taught her and her siblings to work with pride and with appreciation for the beauty of working close to nature. If we want our network of small farms to be a way of life that is worth sustaining, farm work must be a respected vocation that is compensated appropriately for the values farm workers provide for society. Farm Commons (www.farmcommons.org) has a growing list of guides to farm employment law, including specific handbooks for Vermont and New Hampshire, as well as information on internships, farm worker housing, taxes and required paperwork. “Farm Labor Law: Know the Basics and make them work for your farm” is available as a free download. California Guide to Labor for Small Farms, Aug. 2013 NCAT and CA FarmLink. – Much of the information is CA specific, but some applies country wide. Main goal of publication – to boost on-farm learning opportunities and help farms that train interns do it legally. Appendix has template for intern contract and a sample time card for employees. Scale Family Farmers, August 2012, Farmers’ Legal Action Group, Inc.
2013, Farmers’ Legal Action Group, Inc.
*DACUM Occupational Profile for On-Farm Mentor, 2001.